Wooden puzzle box of elongated form with decorations in the shape of a brush, a coin and a pomegranate. Two small drawers on the short ends can be opened and are held in place by a piece of rope. Possibly sandal wood. Japan or China, late 19th, early 20th century. L 9.5 x D 1.55 x H 1.55 in. 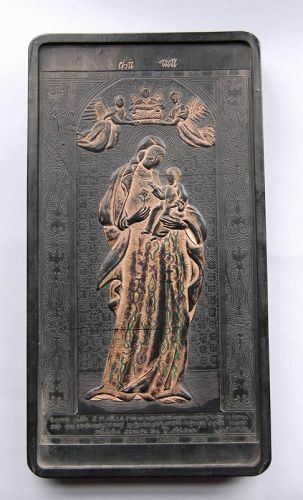 Ink stick, standing Mary with child, Matteo Ricci, China, 20th c.
Tenshu-zu boku. Ink stick, molded with extremely fine details, after the gold coated design by Matteo Ricci (1552-1610). Mary, standing in a portico, holds a rose up to the child on her arm. Above them three angels holding a crown above her head. Inscription in low relief above the image reads tien chu (‘heavenly God’, in connection with Christianity it means ‘Lord of Heaven’). Below the image a longer inscription in very fine relief, in which the name MARIA stands out. The body of mother, child, angels and crown covered partially in gold leaf, details of Mary’s dress accentuated in red and green. On the back an engraved and gilded inscription: Tianzhu tu or Tenshu-zu (image of the heavenly God) and an engraved seal, colored red. On one of the sides in fine and low relief: Da Qing Qianlong nian zhi. 9-3/8 x 5 x 1 in. Torao Miyagawa et al., A history of the art of China: Chinese painting, publ. Weatherhill/Tankosha, New York/Tokyo 1983. Hard cover with dust jacket, 228 pages, 104 paintings described and illustrated in b/w and color. ISBN 0-8348-1527-3. Wu Tung, Tales from the land of dragons: 1000 years of Chinese painting. Museum of Fine Arts, Boston 1997. Paperback with dust jacket, catalog to an exhibition with the same title, 269 pages, 152 paintings with descriptions and with b/w and several with color images, extensive introduction with numerous b/w illustrations. ISBN 0-87846-438-7. R.L. Hobson, Laurence Binyon, Oswald Siren, et al., The Romance of Chinese Art, publ. Garden City Publishing Co., Inc., NY 1936 (later edn.). Hard cover, 192 pages, illustrated with numerous b/w photos, drawings, tables and 12 color plates. Very good condition, dust jacket wrinkled at top. Eleanor Olson, Tantric Buddhist Art, publ. China House Gallery, New York 1974. Paperback, catalog to exhibition at China Institute of America, 100 pages, 54 sculptures, paintings and ritual objects with full descriptions b/w illustrations, few color illustrations, short, illustrated introduction. Fair condition, firm binding, cover with few light stains, creases and dents. Clean text. James Cahill, The Compelling Image. Nature and Style in Seventeenth-Century Chinese Painting, Belknap Press of Harvard University Press 1982. Paperback, 250 pages, numerous b/w illustrations, few color. ISBN 0674152816. Tseng Yu-ho Ecke, Poetry on the Wind. The Art of Chinese Folding Fans, from the Ming and Ch’ing Dynasties, Publ. Honolulu Academy of Arts, 1981. Paperback exhibition catalog for 1982 exhibition, 159 pages, 72 illustrated fans (14 in color) with full description of each, introductory chapter with numerous b/w illustrations. Very good condition. Cover with traces of usage (discoloration of spine and back, few creases), firm binding. Scroll painting, snake in tree, Ouyang Chin, China 20th c.
Hanging scroll with painting in black ink and some red and yellow on silk of a snake winding its way through a dead tree. Signed Ouyang Chin, two red seals, one of which reads Ouyang Chin. China, 1950s-1960s. Japanese style mounting. Image H 39 x W 17 ¾ inches. Total height 69 ½ inches. 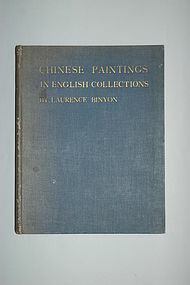 Binyon, Laurence, Chinese Paintings in English Collections, G. Vanoest, Paris/Brussels 1927. 26 pp. text 29 pp. description of plates, 64 black and white plates. Quarto, blue cloth, title gilt-stamped to spine (oxidized) and front cover, gold on upper side pages. Binding is sunned at spine and rubbed and scratched on all sides; crown is lightly bumped. Pages very lightly browned, mostly at outer edges, binding fragile but in place. Hejzlar, Josef. 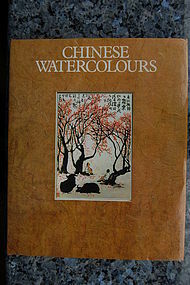 Chinese Watercolours. London: Octopus Press 1980. Hardcover with dustjacket. Text ca. 60 pp., bibliography and index, 115 color illustrations of paintings on 96 pp. (photographed by B. Forman). About the members of the Shanghai school from the 19th and 20th century and their works. Ho, Wai-kam, Sherman E. Lee, Laurence Sickman and Mar F. Wilson, Eight Dynasties of Chinese Painting. 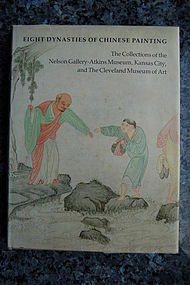 The Collections of the Nelson Gallery-Atkins Museum, Kansas City, and The Cleveland Museum of Art. Cleveland: The Cleveland Museum of Art (and Indiana University Press) 1980. Hardcover with dustjacket. Some wear and tear to dustjackets. Dorrington-Ward, Carol (ed. ), Fans from the east. New York: Debrett's Peerage Limited/The Viking Press 1978. Hard cover binding with dust jacket. 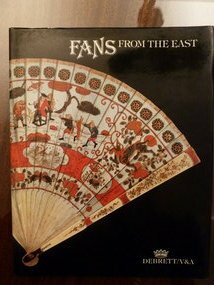 Essays on fans in China (Julia Hutt), Japan (Joe Earle), Southeast Asia (Nancy Armstrong) an on Chinoiserie with 29 color plates and 79 b/w illustrations. Dust jackets with minor abrasions (shelf wear) and covers slightly warped. 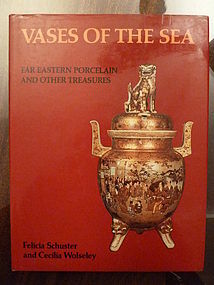 Schuster, Felicia and Cecilia Wolseley, Vases of the sea. Far Eastern porcelain and other treasures. New York: Charles Scribner's Sons 1974. Hard cover binding with dust jacket. Book on vases from China and from Japan made of porcelain, bronze, jade and cloisonne, and also a chapter on ivory and on lacquer. Numerous color illustrations. Few unimportant traces of usage on the dust jacket, all in all in near new condition. 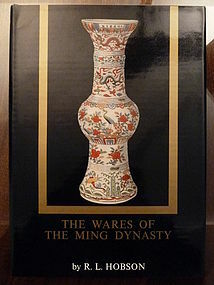 Hobson, R.L., The wares of the Ming dynasty. Rutland/Tokyo: Charles E. Tuttle Company 1962. With dust jacket and with card board slip case. 1st edn. Little tear in back of dust jacket, all in all in near new condition. Book on ceramics and porcelain with 9 color plates, 50 b/w plates, hand drawn marks, etc.